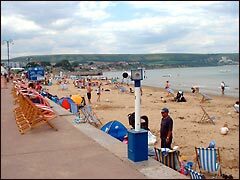 We headed on holiday to the wonderful area of the country known as The Jurassic Coast in Dorset. 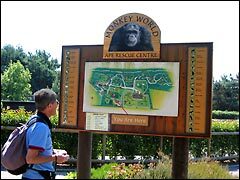 On this page we visit the cute primates at Monkey World Ape Rescue Centre in Wareham and travel through the Isle of Purbeck on the delightful Swanage Steam Railway, stopping off to visit Corfe Castle and the enchanting Corfe Model Village, before reboarding the steam train on to Swanage. This is page one of three. 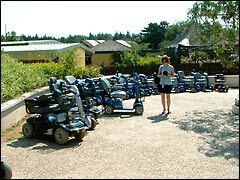 ...start we noticed these motorised buggies available for less able visitors - and in case Belinda's very own cheeky monkey got weary walking around Monkey World's vast grounds in the hot Dorset sun! This was the first of many photos we took of the monkeys - and we did take a lot of monkey pictures! 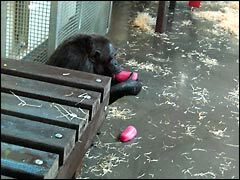 At this enclosure the keepers were throwing in ice lollies which the Chimpanzees were enjoying on this sweltering day, and entertaining us with their antics. The monkeys in the Templer Pavilions at Monkey World were enjoying their cool ices too! This furry guy had cleverly taken to bashing his lolly on that bench to break it up. 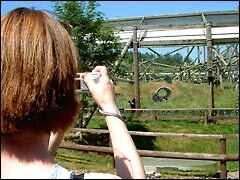 We've some video of the monkeys on our Dorset video clips page. Mike, how did you get in there? This is a gibbon and he (or maybe he was a she, difficult to tell under all that fur!) was very friendly and happy for his (or her) picture to be taken - what a poser! 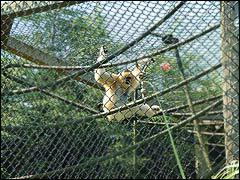 Dorset's Monkey World was opened in 1987 and some 150 rescued and endangered primates reside there. 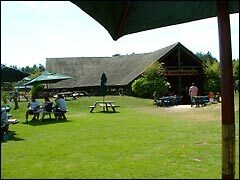 Here's one of several human feeding areas at Monkey World. We had a most enjoyable day in the hot sun, and finished with a visit to the large gift shop! At the time of our visit entrance cost £9 and the attraction had a TV series showing called 'Monkey Business'. 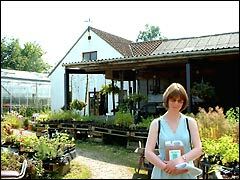 See our UK tourist resources for the website. ...cider tasting. Mmmm, nice! No visit is complete without trying a sample, and Belinda much preferred this tasting to the whisky in Scotland last year! 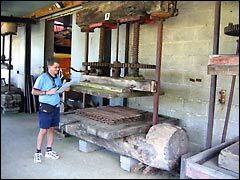 Our look round the interesting Mill House Cider Museum cost £5 and was well worth the impromptu visit. Happy with the tasting, we then bought some - the tanker arrived the next day, that carton was just for the evening! 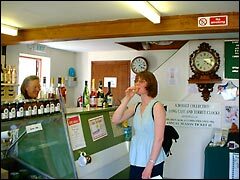 Mill House Cider Museum is just off the A352 east of Dorchester in Dorset. 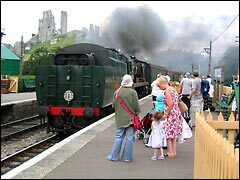 On day 2 we went to visit Corfe and Corfe Castle on the Isle of Purbeck, using the Swanage Railway to travel, neatly avoiding the traffic and parking. It cost £10 including discounted entrance to the castle. 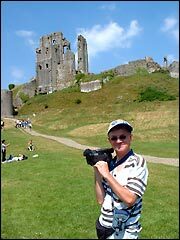 Mike gained a new nickname on our Dorset holiday - Gadget Guy. 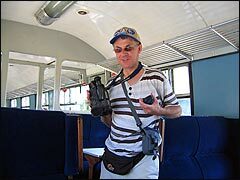 Here he is on the Swanage Railway steam train armed with video camera, stills camera, talkie-walkies, pedometer, mobile phone and Sat Nav (see our Sat Nav review). 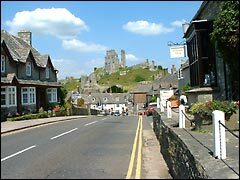 This shot in Corfe was taken from the exact same position as a photo Mike took as a boy back in 1968 on a family holiday based in Corfe village. Nothing much had changed, the only addition seemed to be pedestrian crossing lights and much more traffic. 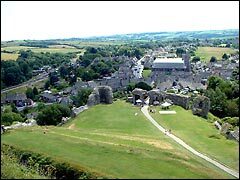 Corfe Castle was built by William the Conqueror in the 11th Century and saw several sieges before being destroyed by the Parliamentarians in 1646. 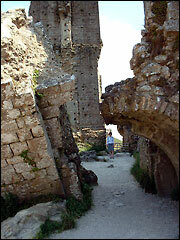 In its time it was used as a royal fortress by English monarchs. 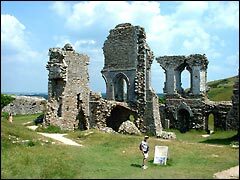 We wandered round the historic Corfe Castle ruins, reading the plentiful notices that vividly brought to life this Dorset castle's heyday. Although we self-paced, guided tours were available. 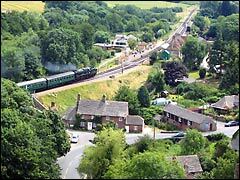 Corfe Castle guarded the main route through Dorset's Purbeck Hills and enjoys commanding views across Purbeck, here looking towards Corfe village, with the railway on the left and church just right of centre. 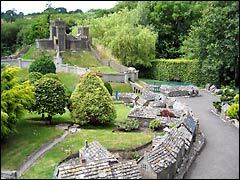 ...visiting Corfe Model Village which depicted how Corfe village looked originally. There was music from the model church and authentic sounds from the tiny model animals and stream. Delightful! OK, I'll be a good boy, please let me out now! Belinda? Where are you? Please let me out! Er, hello... anyone about? We returned to Monkey World Ape Rescue Centre the next year and Corfe Castle in 2016. We've also visited Amazon World on the Isle of Wight. See our other West Country holidays to: Devon, Cornwall and Somerset.